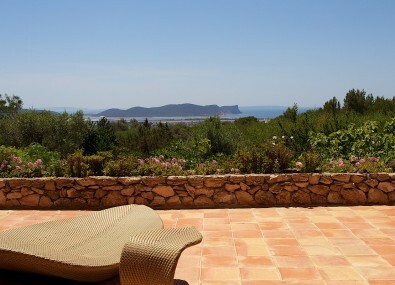 Villa Jardin is a luxury Ibiza villa with pool and amazing sea views. 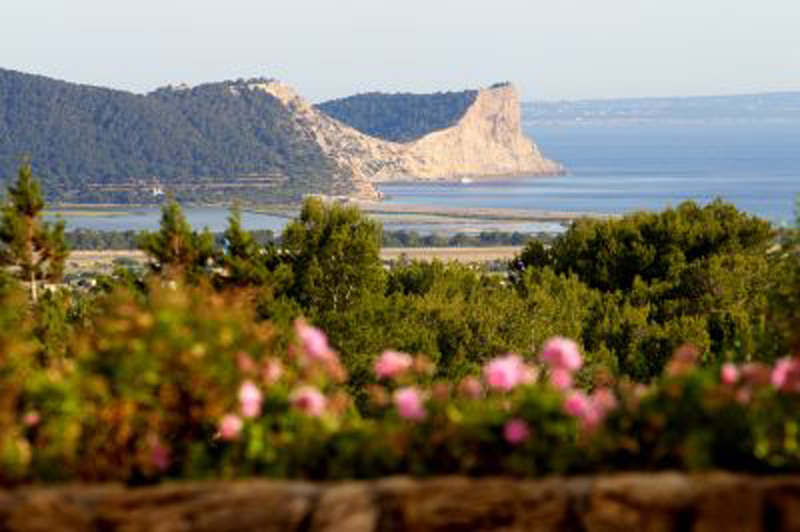 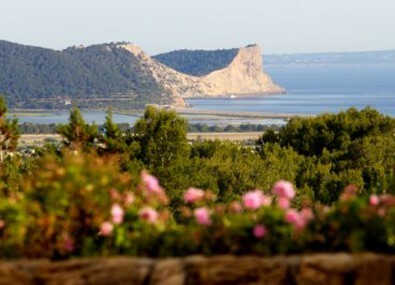 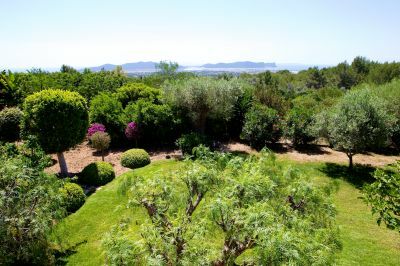 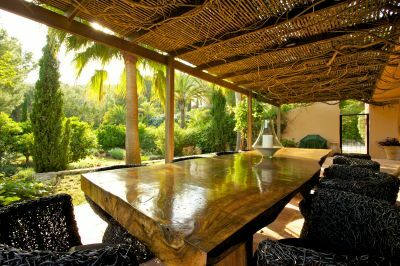 Located close to Ibiza Town and within easy reach of the famous Ibiza beaches of Salinas and Cala Jondal. 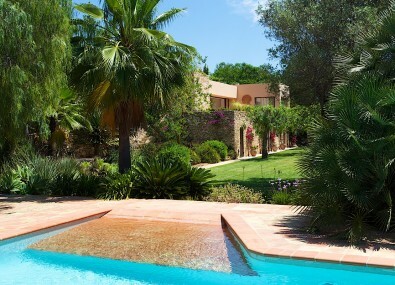 An elegant and alluring property, truly one of our most popular villas. With exceptional attention to detail, the villa is lavishly and comfortably decorated throughout, featuring fixtures and furnishings of the highest quality. The beautifully landscaped gardens are surrounded by luscious palm trees and the swimming pool and outdoor areas are idyllic. 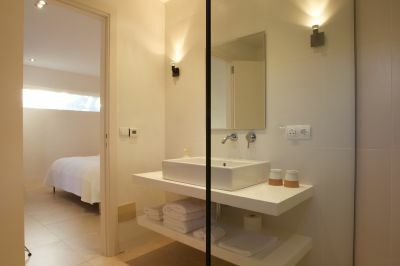 Each room has been individually designed with its own signature look, giving the villa a truly unique and inviting style of its own. In the main house you will find a welcoming living area, kitchen, dining space and two bedrooms. 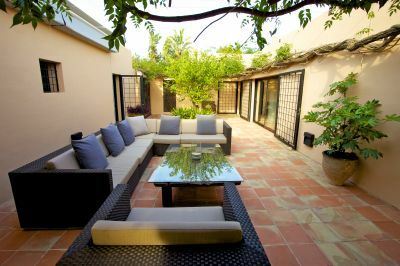 Through the courtyard, which is an integral part of the living area just across from the kitchen/dining area, there are a further two double bedroom suites. 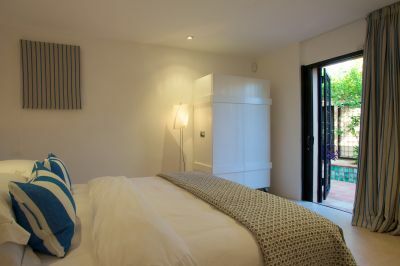 Venturing out from the covered terrace, steps lead down to the lawned gardens, where you will find an additional two guest bedrooms suites, offering an extra degree of privacy. 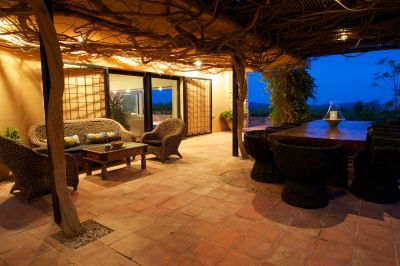 The expansive living area features an inviting and colourful sunken seating space, with a working fireplace and terracotta tiled floors, which contrast beautifully with the elegant and comfortable white sofas. 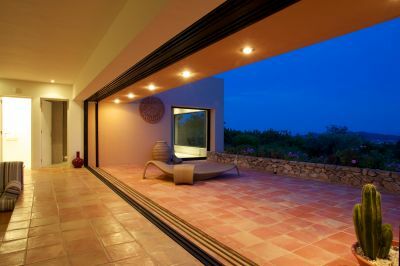 Floor to ceiling sliding windows create a feeling of outdoor living, giving an abundance of natural sunlight, they also offer incredible sea views. There is a ‘state of the art’ TV and sound system with UK satellite. Depending on the weather, it is possible to cover the courtyard or leave open air. 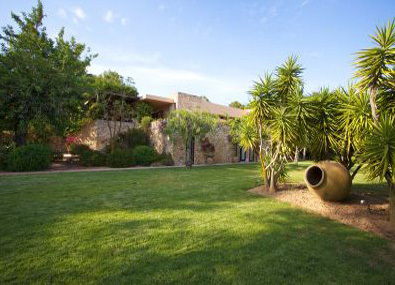 With sofas and stunning views over the pretty manicured lavender garden which stretches the length of the property, this is a favourite spot to enjoy a relaxing moment with a cocktail in hand. 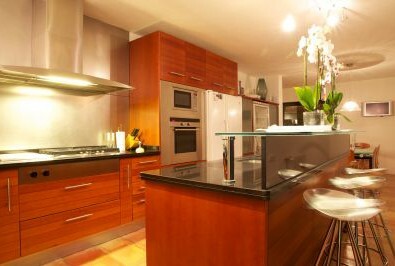 The stylish and modern fully equipped kitchen is complete with table and chairs and also a breakfast bar. A television, oven, hob, microwave, fridge freezer, wine fridge, kettle and toaster are all incorporated, making this the ideal home for those who wish to entertain. 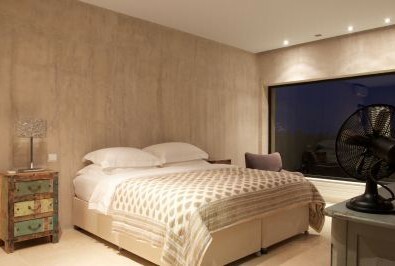 – Master bedroom with walk-in wardrobes, dressing area, satellite TV, private terrace and en-suite bathroom featuring a luxury two person bath. – Double bedroom with floor to ceiling windows overlooking the sea, en‑suite bathroom with a standalone bath and also a walk-in shower. 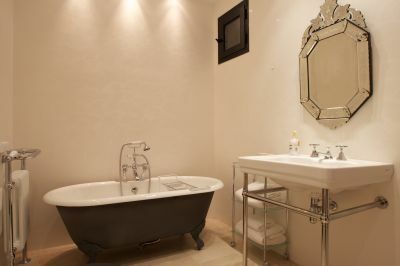 – Double bedroom with en-suite shower room. 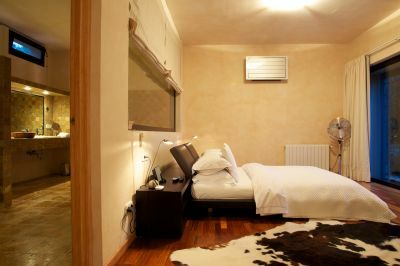 – Twin bed room with en-suite shower room. 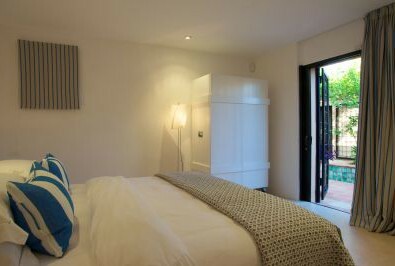 All bedrooms have air conditioning, wardrobes and iPod docking stations. 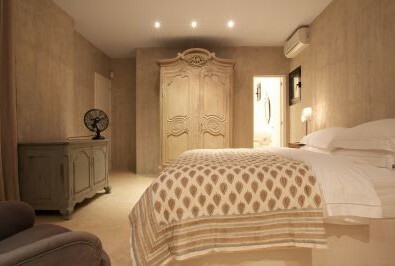 The five double bedrooms all feature a king size bed. 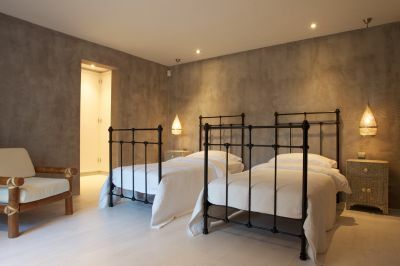 Each of the bedrooms has its own individual style, with items such as animal skin rugs, wrought iron bed frames, ornate vintage mirrors and vintage lighting adding to the eclectic feel of the decor. 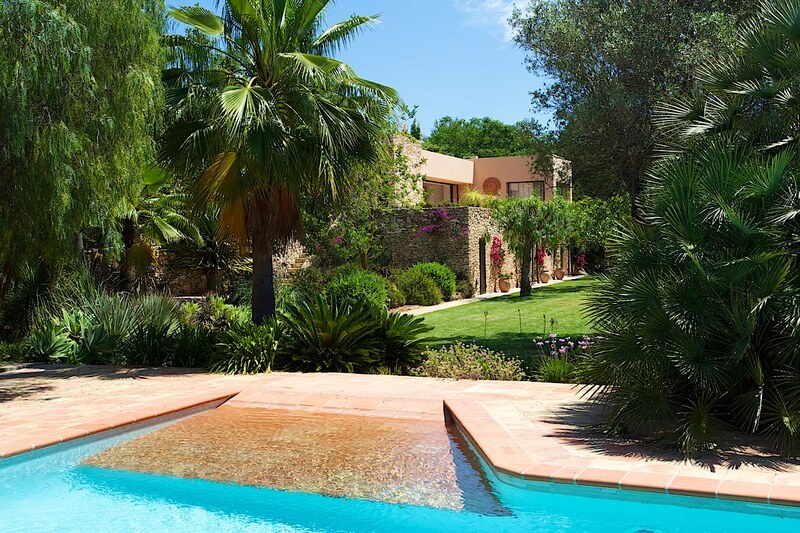 The outdoor spaces, swimming pool area and gardens of Villa Jardin are simply delightful. 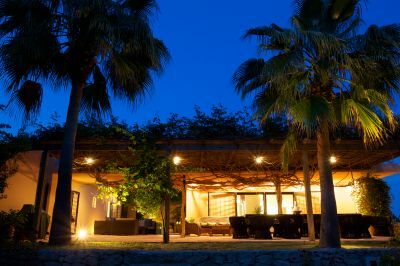 An oasis of calm and tranquillity, the artful blend of traditional style with modern day comfort makes this one of the most enchanting of our villas. Lazing by the large 12m x 6m salt water infinity swimming pool, and enjoying the breathtaking sea views over the salt flats of Salinas, is the ideal way to forget about your cares and worries. 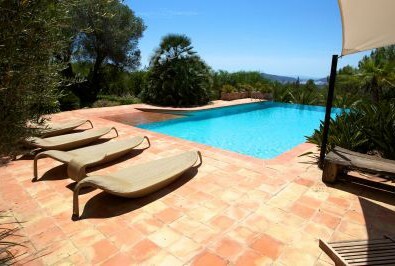 Take some time to soak up the healing Ibiza sunshine on the stylish sun loungers with large sails providing shade. The pool area also has a BBQ, fridge and iPod docking station. Covered terraces with long rustic dining table and chairs offer a space to wine and dine friends and family. In addition, chill out areas and comfy sofas are perfect for lounging and relaxing. 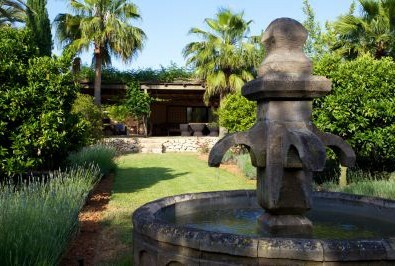 A water feature and fountain with fragrant lavender and orange trees adds to the overall ambience of the outdoor areas. 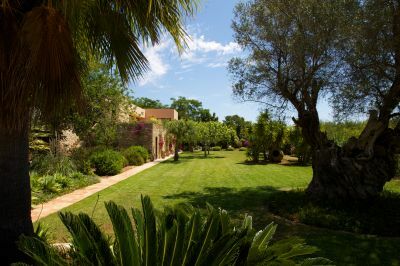 Lush green lawns compliment the garden perfectly, with a 1,000 year old olive tree casting welcome shade. 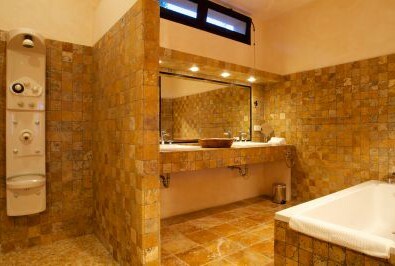 The villa has a separate utility room with two washing machines, tumble dryer, fridge freezer and catering sized oven.